The Village Inn is a bar and restaurant located in Dunblane, Scotland, U.K. This picture was sent in by KW. He writes: "The Village Inn is a pub serving drinks and food, near the railway station in the small cathedral city of Dunblane, Scotland. 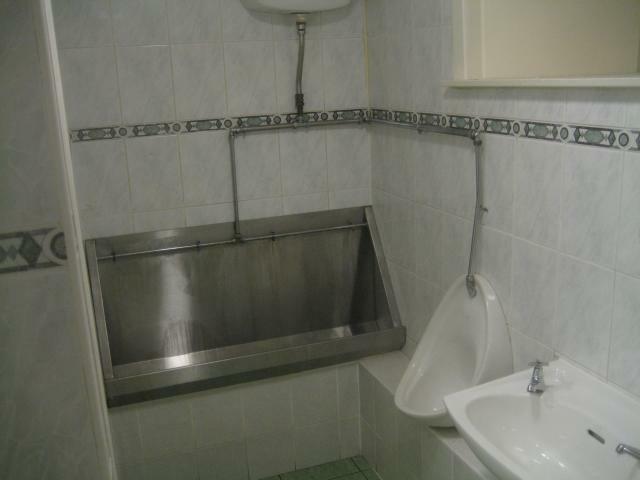 Users of the men's room can choose between an individual porcelain urinal and a steel trough urinal, both flushed from the same tan"
This Village Inn should not be confused with the Village Inn, a restaurant in Monte Rio, California.